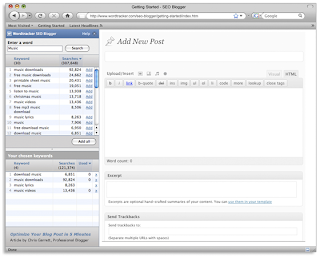 Whether you blog about business, politics or the hot topic of the moment, SEO Blogger allows you to find the most sought-after keywords for your subject without ever leaving your blog editing screen. The tool sits alongside whatever blog publishing software you're using so you can do keyword research and optimize your posts as you write. Then, simply hit "Publish" – and you're done! Make sure you check out our articles on search engine optimization and blogging for tips and advice.